From our roving reporter: seen here are two swarms of bees found on campus recently. We are lucky enough to have a large colony in one veteran oak on campus but there are also other colonies around. Swarms form when queen bees are looking for new nesting sites. 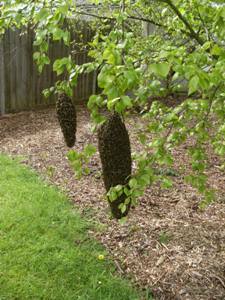 The British Beekeeper Association has some useful information on what to do if you find a swarm of bees where you do not want it but also the advice that its best to leave swarms alone if you can. Locally we have the Swindon Honeybee Conservation Group which has web pages covering many aspects of honeybee care. Nationally The Bumblebee Conservation Trust web site is well worth a look. Our campus with its great range of wildflowers for pollen and nectar and many old trees with hollow spaces provides an excellent place for bees to live and for us to observe them. This entry was posted in Animals, Bees, Insects. Bookmark the permalink.